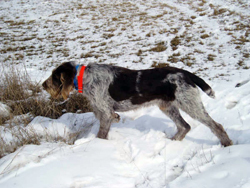 The Spinone Italiano is a versatile gun dog that is loyal, friendly, and with a close lying wiry coat. It has a square but strong build with a well muscled body that will handle all terrain. The Spinone will have a variation of color from solid white, white with orange markings, orange roan, white with brown markings, and brown roan. They are a larger dog with a weight of 65-90 lbs. The Spinone are very affectionate towards people and other dogs. The breed is not known as being aggressive towards humans or other dogs. They are an active dog but not racy like most hunting breeds-they move at a relaxed trot and prefer the slower pace. They have a very good nose and will hunt all upland game and waterfowl. Their coat will need grooming after a day in the field, and the are very intelligent, patient and easily trained. 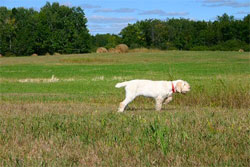 Additional breed information for the Spinone Italiano can be found at the American Kennel Club Website.